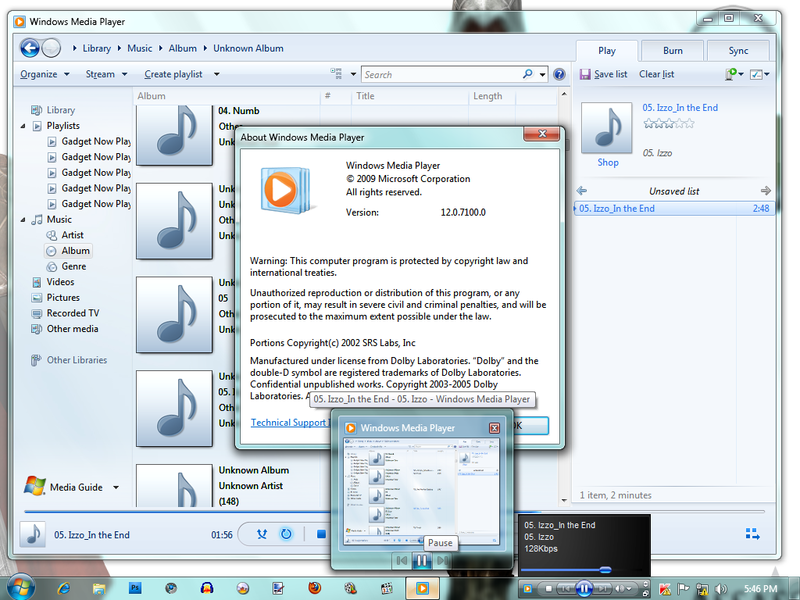 Uptill now, the only way to get back the Windows Media Player toolbar in Windows 7 was by downgrading to WMP11. As u can see, both the preview bar AND the taskbar toolbar is available. 1. Open the start menu and click on "Run"
2. Enter "services.msc" and hit enter. 4. Run the downloaded installer. 5. You are done . Now post ur thoughts on this thread. Notes: There won't be any change in the functionality of your pre-installed WMP12. So dont worry. More details on download page. DISCLAIMER: I am not responsible if u break ur system. Update: It seems the link is dead. Please check this thread: Get the Windows Media Player 12 taskbar toolbar. Edited by Jatin, 27 January 2013 - 08:05 AM. Does this work on RTM build? The screenshot says build 7100 (RC). How does the Deskband or Toolbar look like when the Taskbar is not set to "Small Icons"? Does WMP minimize to this Deskband even when the taskbar is set to "Combine when taskbar is full"? Or does it show both the running WMP Application icon(with name in this case) and dekband? 1. Yes it worked on RTM for me. It doesnt really change the original WMP files already present. It patches some of them, copies some old WMP11 dlls into system32(and registers them) and the most important thing - the Registry Changes. 3. This toolbar works almost independent of WMP except that the actions are synchronised. Its behaviour is different from how the original toolbar worked. But the main point is it controls WMP and yet doesnt interfere/change anything. Thats wonderful job. I tried it in Windows 7 RTM version. It installed successfully and I was successful in adding the toolbar to Taskbar but the toolbar is non-functional. No button is working, only the progressbar works while hovering on the toolbar. 1. Yes. It works in RTM. 2. Same size as of WMP 11 toolbar. 3. No. WMP taskbar button is always visible. It doesn't minimize to toolbar. Oops. Dev already replied to Abhi's queries. Edited by Vishal Gupta, 09 August 2009 - 11:20 AM. 5. Now hopefully it shud work fine. This is so much more useful than the stupid window preview. I don't know why MS got rid of this. Finally the old toolbar! Awesome job My Lord! Do you think you're gonna make a 64 bit version anytime soon? Would be great! I will need the 64bit files. Lets see if I can get VMWare today....or maybe if someone supplies them to me . Ya, we are talking fediafedia here. It would look great if it acted part of the taskbar, so it changes colors with the theme you use and adjusts to it. So a transparent background would work well I suppose. Haven't tried it though. But I'm glad it works for you. Awesome work like always Dev, sorry I wasn't here to test it. Edited by CommonSense, 09 August 2009 - 11:57 PM. Thanks for the clarifications Dev and Vishal! BTW, any way to "un-install" or revert back to the original behavior, so that I might try it without any issues?